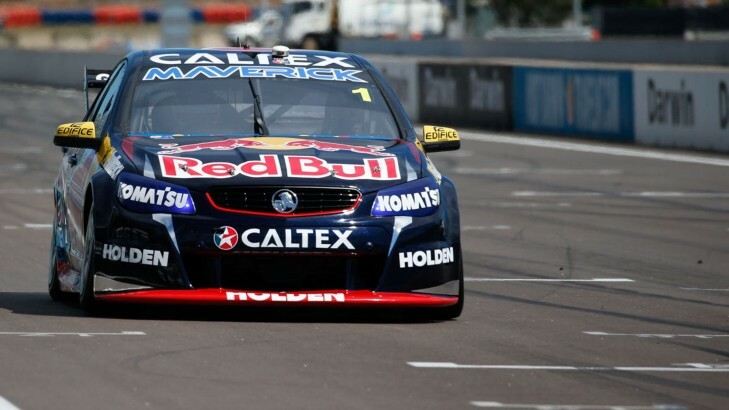 Red Bull Racing Australia team boss Mark Dutton admitted defending champion Jamie Whincup was apprehensive about the team's risky strategy in yesterday's 200km sprint at Hidden Valley. The team elected to run the entire race on the soft compound Dunlop tyre, known for degrading quickly though generally producing more speed. However, Dutton explained the strategy itself would have paid off if not for an error in judgment by the team, which failed to correctly match the car setup with that strategy. 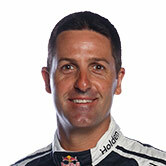 "[Whincup was] definitely apprehensive because it was an aggressive strategy," Dutton told v8supercars.com.au. "We knew it was aggressive, we thought we'd done enough homework and we hadn't. "It wasn't careless ... really, that strategy itself would've worked but we had to find the setup that worked." Both Whincup and Craig Lowndes - starting further back on the grid than they're used to, in 12th and 15th - ran the same strategy and suffered the same tyre delamination issue after 46 laps on the soft tyre. Eventual race winner David Reynolds completed 59 laps on the soft tyre - forced to stay on the set of tyres after one of his hard tyres deflated - and didn't have any issues. "Temperature management was the biggest problem, which is a setup thing, so that was an issue," Dutton said. "The tyre didn't run out, we just cooked it too much and that's why they delaminate. So we read half the story and made a mistake, not looking at it long enough. "You do have to extrapolate and make some assumptions, but we didn't make the assumptions we should've - we only looked at the information at hand, not extrapolating the data and said 'this won't just be linear, this will be exponential' and it resulted in what happened with both cars. While the same issue affected Lowndes, the final result wasn't as bad for the #888 driver - the Championship margin to leader Mark Winterbottom has expanded to 95 points. Whincup now sits down in eighth position, 286 points away from the front, with 300 is the maximum a driver can earn across one race weekend. Dutton acknowledged it would be difficult for the six-time champ to comeback, but knows the team is capable of bouncing back and pushing hard. "It'll be a huge fight for Jamie, obviously we've lost a lot of points so it's been a bad weekend for that," he said. "Craig's obviously lost a lot of points he was going to score, because it was an excellent recovery until what happened. "So a lot of work to be done but ... we've been in those type of positions before." The team boss - who took over the role from the start of last season, after engineering Jamie Whincup to five of his six titles - said it wouldn't be hard for the crew to regroup, particularly as there were some gains made across the weekend. There was also the high of Lowndes winning his 100th V8 Supercar race on Saturday, becoming the first driver to reach the impressive milestone. "We did some very good things, learnt a lot, made some mistakes, as everyone saw," Dutton said. "Generally everyone thinks we've been winning so long it's easy. It's never easy, it just looks easy sometimes - so there's always this amount of hard work and pressure on everyone." Heading into the Darwin event, Whincup told v8supercars.com.au the team needed to roll out on track better prepared - this time it was the opposite. "Straight out the gate we were relatively competitive, were on track but never really improved and the other guys moved forward," Whincup said. When asked how the team arrived at the decision to run such a risky strategy, the #1 Red Bull racer responded with: "I had no involvement whatsoever, I was just focusing on my job, which was pretty tough out there - you see so many cars spearing off." He did admit to having a "gut feel" when he was told the plan, but seemed to think it wasn't his place to intervene on that level. "You've got gut feels, but I always keep independent of that - I trust the skill base of the engineers to make the calls and they've made the calls with the information they've got. "Yeah, whatever they come up with I'm committed to that, try to make it work as much as we can." He knows it will take a lot to come back from this position in the title fight but preferred not to focus on that too much. "Yeah it's a long way back from here, but let's not talk too much about it, it's just about going fast and trying to win races," he said.